Jessica Chiarella’s debut novel, And Again, just came out this month, and she kindly answered a few of my questions about it, and more! Please give her a warm welcome! Will you tell us a bit about your debut novel And Again and what inspired you to write it? 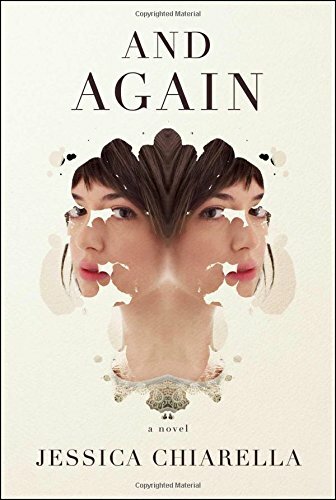 And Again is about a group of terminally-ill patients who take part in a pilot program called “SUBlife,” in which their memories are transferred into cloned copies of their old bodies. They essentially have a second chance at life in a brand-new body, totally free of age or environmental damage. The story is about their struggle to reenter their old lives without many of the physical attributes and habits that once defined their identities. I’ve long been fascinated by the way our physical selves impact our identities, but the actual inspiration for the book came from thinking about severe illness, and what a “miracle cure” might look like. I didn’t think a cancer cure, for instance, could ever be limited to a single treatment or a single medication. I figured anything that could act as a panacea would have to be something much more holistic, like getting a completely new body. And the idea just sort of grew from there. What kind of research did you do for the book, and what is your writing process like? I actually did very little research for the book, because I didn’t want the focus to be on the science of cloning or the way the memory transfer would work. I didn’t want the reader to be distracted from the characters and their personal conflicts by adding in a lot of scientific jargon. I’d just read Octavia Butler’s Kindred when I began writing, and I drew heavily from the way she treats time travel in that novel. In Kindred, it doesn’t take the characters long to understand the mechanism and the rules of time travel, and once they do the narrative becomes wholly about how the characters handle the situation they’ve been thrust into. They don’t need to understand why it is happening; their main concern is what they do next, how they handle it. So, in And Again, SUBlife functions as sort of a “magical” element within the book that is not meant to be read as literally scientific. The writing process of the book was a little intense, actually. I initially wrote it in Rebecca Johns Trissler’s novel-writing class at DePaul University, in which everyone had to write 60,000 words in ten weeks, take a week for spring break, and then return to revise the draft in another ten weeks. It was a very fast pace, and we were exhausted by the end, but it turned out to be invaluable, as I walked away with a first draft and a lot of early feedback with which to revise. After that, it was just a matter of working with what I already had over roughly the next year or so. Have you always wanted to be a writer? Will you tell us more about yourself and your background? I have always wanted to be a writer, and always wrote for fun, but I spent a lot of time trying to talk myself out of it as a career path. I didn’t realize that writing often involves a great deal of uncertainty and a great deal of difficulty. I would get to a point in everything I wrote where I wouldn’t know where to go next, and I just assumed that meant that I wasn’t very good at it. So, I ended up graduating with a BA in political science, took a hard look at law school, and realized that the only think I could imagine doing that would really make me happy was writing. And as soon as I came to that conclusion, everything began to make sense. I went to DePaul for my MA in writing and publishing and then got into the University of California, Riverside’s MFA program, which has been an absolute dream. Writing is still very, very hard. It still comes with a great deal of uncertainty. But it is a different sort of difficulty than slogging through work that I’m not passionate about. It’s a difficulty I can sit with. I wrote a story in first grade about having my tonsils taken out, which my mom still has somewhere. But the first time I wrote fiction was in third grade, a Little House on the Prairie-inspired story about a frontier girl who has to run to get a doctor when her pregnant mother goes into labor unexpectedly. I remember writing that and just being so jazzed about the freedom of being able to put something I imagined down on paper. After that, I was hooked. What are some of your favorite authors? Is there anyone that has particularly influenced you? I’ve been influenced by so many authors, it’s difficult to think up a comprehensive list. Janet Fitch immediately comes to mind, because I read White Oleander when I was about fifteen and thought it was about the fiercest, most beautiful book I ever got my hands on. Some other favorites are Kazuo Ishiguro, Jennifer Egan, Michael Cunningham, Roxane Gay, and Audrey Niffenegger. They also happen to be huge influences on my writing, which I don’t think is any surprise. Maybe The Hours by Michael Cunningham. I remember stopping at so many points in that book to simply revel in the beauty of its language and the complexity of the interlocking stories. I think Cunningham has the ability to so effectively do what every writer strives for, which is to show the world to you in a way that feels at once extremely familiar and also completely unexpected. Right now I’m putting together my reading list for an Intro to Fiction class I’m teaching, so I’m re-reading a lot of short fiction that I love, like George Saunders, Amina Gautier, Karen Russell, and Junot Diaz. I’m also doing some research for my next book, reading a few books about WWII nurses. And a biography of Robert Mapplethorpe. I’m working on another novel, my thesis for UCR’s MFA program. It’s another speculative novel, also set in Chicago. It’s been a wonderful experience, to be in this program leading up to And Again coming out. The amount of support I’ve had from the faculty and other students has been tremendous. I really feel exceptionally lucky that I get to do this, imagine things and put them down on paper, and I’m trying not to take a moment for granted. In the spirit of Station Eleven and The Age of Miracles, this exciting literary debut novel imagines the consequences when four ordinary individuals are granted a chance to continue their lives in genetically perfect versions of their former bodies. Would you live your life differently if you were given a second chance? Hannah, David, Connie, and Linda—four terminally ill patients—have been selected for the SUBlife pilot program, which will grant them brand-new, genetically perfect bodies that are exact copies of their former selves—without a single imperfection. Blemishes, scars, freckles, and wrinkles have all disappeared, their fingerprints are different, their vision is impeccable, and most importantly, their illnesses have been cured. But the fresh start they’ve been given is anything but perfect. Without their old bodies, their new physical identities have been lost. Hannah, an artistic prodigy, has to relearn how to hold a brush; David, a Congressman, grapples with his old habits; Connie, an actress whose stunning looks are restored after a protracted illness, tries to navigate an industry obsessed with physical beauty; and Linda, who spent eight years paralyzed after a car accident, now struggles to reconnect with a family that seems to have built a new life without her. As each tries to re-enter their previous lives and relationships they are faced with the question: how much of your identity rests not just in your mind, but in your heart, your body? And Again, interview, Jessica Chiarella.